The BikeSafe program at the University of Miami Miller School of Medicine (“University”) supports and encourages the dissemination and exchange of information for public benefit. This Intellectual Property Terms & Conditions of Use agreement (“Terms & Conditions”) sets forth the terms of service that govern the University’s relationship with users and others who interact with this website and the BikeSafe program. By using or accessing this website and BikeSafe program materials, you agree to these Terms & Conditions. If you do not agree to all of these Terms and Conditions, you may not access, browse, and/or use this website. The University owns all trademarks in the BikeSafe program and all copyrights in the BikeSafe program materials. The BikeSafe program has no objection to its own materials being reproduced or made available online or electronically, provided that (1) it is for your own personal, non-commercial use, or for use within your organization and (2) materials remain in their original, unaltered form and the BikeSafe program is recognized as the owner/creator. None of the BikeSafe materials may be otherwise reproduced or used for commercial purposes without the written permission of the University. Please note that the University’s trademarks and copyrighted materials can only be used with the University’s permission and with certain conditions. No advertising or marketing materials having or containing any reference to the University of Miami, or in which the University of Miami names are used, shall be used nor shall any other use of the University’s faculty, student or employees’ names, logos, or trademarks be made by you or anyone on University’s behalf unless and until the same shall have first been submitted to and received the written approval from the Assistant Vice President of Business Services. All entities that choose to implement the BikeSafe program, other than as permitted herein, must contact the University to enter into a Licensing Agreement. The information presented on the website is distributed by the BikeSafe program as an information source only. With respect to information available from this website or toolkit or any other program materials, neither the University nor any of its officers, trustees, agents, employees, faculty, students, volunteers or the BikeSafe program makes any warranty, express or implied, including the warranties of merchantability and fitness for a particular purpose, statements, representations or guarantees about the accuracy or completeness of – and you should not rely on – any information contained in this publication. University makes no representations or warranties about use of the BikeSafe program. Accordingly, you acknowledge and agree that you shall use the program at your own risk and disclose to participants that their use is at their own risk. The UNIVERSITY, its officers, trustees, agents, employees, faculty, students, volunteers and The BikeSafe program disclaim all responsibility for information contained in this document, SITE AND CONTAINED IN THE PROGRAM MATERIALS and all liability (including without limitation, liability in negligence) for all expenses, losses, damages and costs you may incur as a result of the information being inaccurate or incomplete in any way or for any reason. The UNIVERSITY, its officers, trustees, agents, employees, faculty, students, volunteers and the BikeSafe program disclaim all liability for any damages arising from your access to or use of any material or part thereof within this website or tool kit and do not assume any legal liability or responsibility for the accuracy, completeness, or usefulness of information, apparatus, product, or process disclosed; nor represent that its use would not infringe privately owned rights. YOU AGREE TO NOTIFY THIRD PARTIES IN ADVANCE OF SHARING ANY MATERIAL FROM THIS SITE WITH THAT The UNIVERSITY, its officers, trustees, agents, employees, faculty, students, volunteers and the BikeSafe program disclaim all liability for any damages arising from THEIR access to or use of any material or part thereof within this website or toolkit and do not assume any legal liability or responsibility for the accuracy, completeness, or usefulness of information, apparatus, product, or process disclosed; nor represent that THEIR use would not infringe privately owned rights. The BikeSafe Curriculum is intended to expand the use of the BikeSafe program across the country. The program offers its trademarked and copyrighted materials to organizations and entities interested in promoting bicycle safety and health. The program is expanding to a national level and the use of BikeSafe program materials is becoming more widespread because of the program’s evidence-based approach. The University provides access to our educational materials at no cost and promotional items at minimal cost in order to encourage affordable usage of the program. TERMINATION. These Terms and Conditions may be terminated by the University, with or without cause, by providing you with at least ten (10) days advance written notice of such termination. REVISIONS. The University may revise the Terms and Conditions at any time without notice by updating this policy. By using this website you agree to be bound by any such revisions and should therefore periodically visit this website and page to determine the then current terms and conditions of use to which you are bound. OWNERSHIP OF MARK AND COPYRIGHTS. You acknowledge and agree that University owns, and shall own, all right, title and interest worldwide to the above-referenced BikeSafe mark and copyrights, and that University shall have the sole right to register the mark and copyrights in any country and/or anywhere in the United States of America. You acknowledge and agree that all use of the mark and copyrights by you shall inure to the benefit of University. TRADEMARK AND COPYRIGHT INFRINGEMENT PROCEEDINGS. University shall have the sole discretion to initiate and conduct infringement proceedings or other proceedings involving the mark and/or copyrights, and you shall reasonably assist and provide University with information for any such proceedings, if necessary. TRADEMARK AND COPYRIGHT QUALITY CONTROL. As University and you hereby acknowledge, U.S. and international trademark laws require that the trademark owner (University) maintain quality control of its licensed mark. In keeping with the trademark quality control requirements of the U.S. and international trademark laws, you agree that the trademarked goods/services covered by these Terms and Conditions shall be of high standard, style, appearance and quality and to be adequate and suited to their exploitation to the best advantage and to the protection and enhancement of the mark and the goodwill pertaining thereto; that such goods/services will be designed, manufactured, sold and distributed in accordance with all applicable federal, state and local laws; and that the policy of sale, distribution and/or exploitation by you of such goods/services shall be of the highest standards and that the same shall in no manner reflect adversely upon University or the mark. In addition, you shall, before selling or distributing goods/services or items bearing or used in connection with the mark, furnish to University free of cost for its approval, a reasonable number of samples of the goods or description of services and other items that bear the mark (but University realizes that all BikeSafe promotional items shall be obtained from University; consequently, you need not supply samples of those promotional items to University). AGREEMENT TO REPORT USE OF MATERIALS. 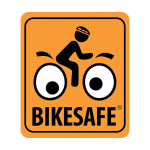 You acknowledge and agree to submit a Curriculum Completion Form via the BikeSafe website, www.ibikesafe.us, following implementation of the BikeSafe educational component (three-day curriculum) at your school. This form shall be completed and submitted annually, as applicable, by a school representative within one month of implementation at the school. ASSIGNMENT AND SUB-LICENSE. These Terms and Conditions and all rights and duties hereunder are personal to you, and they shall not, without the written consent of University, be assigned, transferred, mortgaged, sublicensed or otherwise encumbered by You or by operation of law. INDEMNIFICATION. University assumes no liability to you or to third parties with respect to the goods/services designed, manufactured, distributed or sold by you involving the mark or copyrights. You shall indemnify the University for any claims arising from your use of the mark or copyrights. NO WARRANTIES. University makes no other warranties, either express or implied, with respect to the mark and copyrights. LIMITATION OF LIABILITY. In no event will the University be liable for any damages, including, without limitation, direct, indirect, special, incidental, or consequential damages, damages relating to the use or inability to use this website, the materials or other information contained in this website, whether based on warranty, contracts, statutes, regulations, tort (including, but not limited to, negligence), or any other legal theory and whether or not advised of the possibility of such damages. INTERPRETATION. These terms shall be governed and construed in accordance with the laws of Florida. University and you hereby consent to jurisdiction and venue in the courts sitting in Miami-Dade County, Florida. RELATIONSHIP. These Terms shall not be construed as creating a partnership, joint venture or agency relationship, or as granting a franchise. PUBLIC FORUMS. This website may make forums, message boards, and/or news groups available to you. Please remember that any information that is disclosed by you or others in these areas is not private and becomes public information. You should exercise caution when deciding to disclose your personal information in these or other similar areas of our website. You are prohibited from posting or transmitting to or from this Site any unlawful, threatening, libelous, defamatory, obscene, scandalous, inflammatory, pornographic, profane material, or any other material, including, but not limited to, any material that could give rise to any civil or criminal liability under both domestic and international law. PRIVACY STATEMENT. Your privacy is very important to us. Simply stated, our policy is to collect no personally identifiable information about you when you visit our website unless you actively choose to make such information available to us. In addition to information collected by technology, some parts of our website may ask you to provide personal information. You will know when you are sharing personal information with us because you will need to send a message, fill out a form or application or answer questions, and then agree to provide this information to us. If you choose to share personal information with us, we will use the information only for the purposes you have authorized. Some of the information we collect or that you provide may be saved for a designated or indefinite period of time, but we will not disclose the information to third parties or government agencies, unless required to do so by state or federal law, in support of University sponsored programs or activities, or to protect the integrity, safety, and security of our website. We do not knowingly collect online contact information from children under 13 years of age without prior parental consent or parental notification, which will include an opportunity for the parent to prevent use of the information and/or participation in the activity. In the absence of prior parental consent, online information will only be used to respond directly to the child’s request. Such information will not be used for other purposes without prior parental consent. We do not distribute to third parties any personally identifiable information without prior parental consent. We do not give the ability to publicly post or otherwise distribute personally identifiable contact information without prior parental consent. We do not offer special games, prizes or other activities, to entice users to divulge more information than is needed to participate in the activity. We will, however, provide personal information collected about children if required by law, for example, to comply with a court order or a subpoena, or to protect the integrity, safety and security of our website. For general questions about the BikeSafe Program, please call 305-243-0349.